In this section of the website, we provide information for converting between various cooking units. Convert between Celsius (Centigrade), Fahrenheit and Gas Mark settings. Convert between feet and inches, and millimeters, centimeters or meters. Convert between liquid volume measurements including teaspoons, tablespoons, fluid ounces, pints, millileters and liters. Convert between ounces, pounds, grams and kilograms. Talented Kitchen's Magnetic Kitchen Conversion Charts. Includes weight conversion chart, liquid conversion chart, temperature conversion chart and more. Talented Kitchen's Magnetic Measurement Conversion Charts was carefully designed to give useful information at your fingertips. 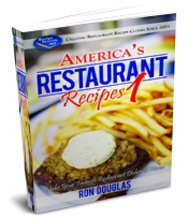 This the perfect gift for people who really love to cook and bake. Our magnet Includes the most common conversions you'll need: weigh conversions to ounce, pound, gram, Liquid volume conversions to fluid ounces, teaspoon, tablespoon, cups, pints quarts, gallons and liter units, plus convert gas mark and electric oven temperatures in Celsius and Fahrenheit. Invaluable guide for cooking for the family, cooking with kids, baking, diet tracking for weight management portion control or diabetic diets. Talented Kitchen's Measurement Conversion Magnet is the perfect size to quickly and easily find the information you need, ideal for everyone who loves to cook and bake. 100% magnet. Stick to metal surfaces without causing any damage like a sticker or label might. Cooking temperature conversion chart with gas marks, Fahrenheit and Celsius. Tea spoons (tsp), tablespoon (Tbsp) to fluid ounces, cups or liters. "RIGHT ON YOUR FRIDGE".... Okay, next to reaching for the sugar and there is none, nothing else slows down the baking process more than conversion problems. We have a solution, Kitchen Conversion Tymes. No more searching the internet to find out how many sticks of butter equal 8ozs or how many "ml" are in a cup. A quick glance at our chart and you're back to baking butter tarts. "FULL 30mil MAGNETIC"... 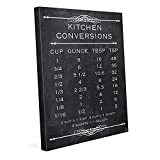 The Kitchen Conversion Chart is made with a strong and full 30mil magnetic backing so it will stick and stay securely wherever you decide to put. Made in the USA. 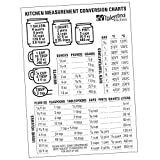 "MOST COMMON CONVERSIONS" ...Our Kitchen Conversion Tymes chart includes the most common conversions you'll need i.e. . Butter by weight volume and sticks, Liquid Volumes, Dry weights, Oven temperatures that convert gas marks and electric oven temperatures in both Celsius and Fahrenheit and more. This chart will take away the guess work and help you make the perfect pie. We all love pie. *** INSTANT 10% SAVINGS ON PURCHASE OF 2 OR MORE OF ANY INTEL KITCHEN PRODUCTS. Please do not order any other type of product in the same shipment to avoid the magnet to be bent and damaged by the other product in the same shipping box. EASY TO READ INSTANTLY: This Kitchen Conversion Chart Magnet is designed by a multi-award-winning art director. Well-designed graphics and large font size are for quick and easy reading at a glance and from a distance. Save time from searching on your smartphone with this hands-free refrigerator magnet. No more mess to clean or bacteria to touch on your smartphone. A must-have cooking aid tool next to kitchen food scale for quick reference on many types of metric and US measurement conversions. MADE IN USA: It is uniquely designed, copyrighted and sold exclusively by First-Rate Gifts. It is splash proof and can be wiped clean easily. Buy this Magnetic Kitchen Conversion Chart today and get our 1 Year Worry-Free Money Back Guarantee. Buy one for yourself and one for someone you love! Just click the "Add to Cart" order button now! Your search for the perfect Kitchen Conversion Chart Magnet is finally over! Our 8" x 11" magnetic chart is larger and contains more conversions than the others. Conversions are in US measurements. Some rounding appears for ease of use. Please do not stick the magnet on an area that gets really HOT, the magnet is NOT heat-proof. For any possible defective products, please contact us first. We will offer you a replacement or a refund. ① FIVE UNIT OF MEASUREMENT: Measure conversion chart for Cups, Tablespoons(TBSP), Teaspoons(TSP), Fluid Oz and Milliliters(ML), full sizes to meet your needs. No more guess in kitchen! ③ DURABLE: 18/8 Stainless Steel won't rust or break. The volume measurements are engraved and will never rub off. ⑤ MEASURING SPOONS:Copy this link (http://a.co/hdGlvur) to find a 18/8 stainless steel measuring spoons set. 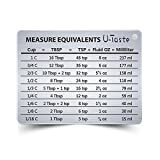 ① Easily figure out metric conversions using this U-Taste measure conversion magnet. ② Made from 18/8 stainless steel, it features a brushed exterior. ③ It displays conversions for cups, tablespoons(TBSP), teaspoons(TSP), fluid ounces(OZ), and milliliters(ML). ④ Use the strong magnetic backing to attach it on the refrigerator or any metal door to glance at while cooking or baking. ⑤ Perfect gift idea, great for wedding, house warming, mother's day or birthday. Your loved ones will appreciate it. Egg boiling time, Freezer shelf lives, Dry spaghetti measure. Conversions for altitude, bread, butter, egg, flour, rice, sugar, turkey, water, and yeast etc. 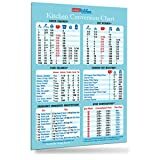 Carefully designed to match nearly any kitchen or refrigerator, we invented this 10.5" x 15.5" kitchen conversion chart to be durable, washable, useful, and (of course) beautiful. It will easily and attractively fit on any side-by-side fridge door, yet also look great on over-under fridge doors. The tans, yellows and umbers in the chart help it match any modern kitchen cabinet from oak to cherry, mahogany to maple to white, whilst also showing sophistication against stainless steel refrigerators. This chart packs so much information that great cooks will wonder how they did without it! Made in USA. Comes with INSTRUCTIONS on how to apply- but we suggest you also watch a youtube video. These are DECALS that you can apply to the inside of your baking cabinet. It is a good way to know how to convert a recipe when needed. You can also put up strips to hold your measuring cups and spoons underneath them. This is ONLY for the decals..... If you want a color other than BLACK OR WHITE you must choose OTHER COLOR and leave a message in GIFT MESSAGING with the color you want from the color chart in the 3rd picture. ★ HOW FUN - This unique art is guaranteed to tie any place together and bring you joy while viewing it. ★ READY TO FRAME - You get one 11" x 14" print. 11" x 14" frames are super easy to buy here on Amazon or at any department or craft store. Choose the frames that work with your decor and the print! ★ MADE TO LAST - This print is printed on semi-matte Fuji Crystal Archive paper to last a lifetime. Easily figure out metric conversions using this RSVP Endurance measure conversion magnet. Made from stainless steel, it features a brushed exterior. Use the strong magnetic backing to attach it to the refrigerator. WITH MARKER FOR WRITING: shaped magnet for writing your favorite cook times, drawings, recipes. You & your kids will love to doodle on the blank magnet while you're waiting for your food! And the kids will know what's for dinner tonight. cheat sheet Erasable marker also includes magnet to attach to your Instant Pot . GUARANTEE£ºYour satisfaction is our top priority. We believe you will be satisfied with our products and services.However, if you can try us and make sure your purchase is insufficient to meet your needs, you can contact us by email to get a full refund or change the new product within one month.We strive to provide you with the best after-sales service.